My review of Wachtel and Holmes’ The Textual History of the Greek New Testament has been published by RBL. 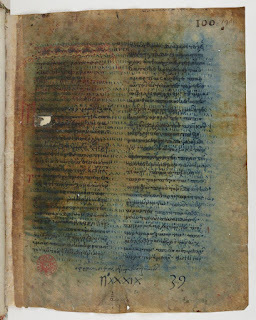 In keeping with the current theme, images of Codex Claromontanus (D 06) (Paris, BN, Greek, 107AB) are also online courtesy of the Bibliothèque nationale de France. The Israel Antiquities Authority (IAA) is very proud to present the Leon Levy Dead Sea Scrolls Digital Library, a free online digitized virtual library of the Dead Sea Scrolls. 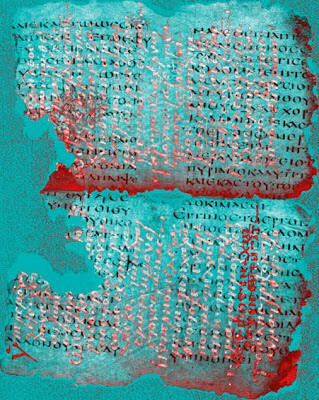 Hundreds of manuscripts made up of thousands of fragments ­ discovered from 1947 and until the early 1960’s in the Judean Desert along the western shore of the Dead Sea ­ are now available to the public online. The high resolution images are extremely detailed and can be accessed through various search options on the site. Daniel Wallace has written a generally positive review of NA28. 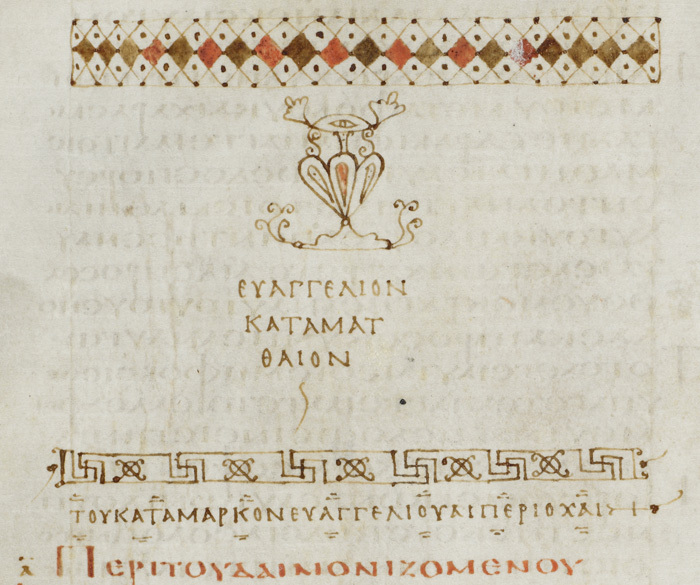 Images of Codex Ephraimi Rescriptus (C 04) are also online courtesy of the Bibliothèque nationale de France. 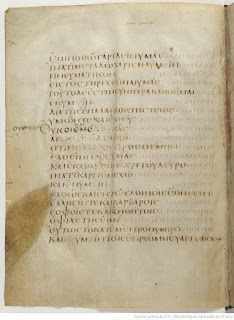 The British Library announces here that it has put images of the NT of Codex Alexandrinus online here For some time the CSNTM has kindly had images from the facsimile available here, which have the advantage that they can be copied and edited. For most other purposes the BL ones are superior, for obvious reasons. 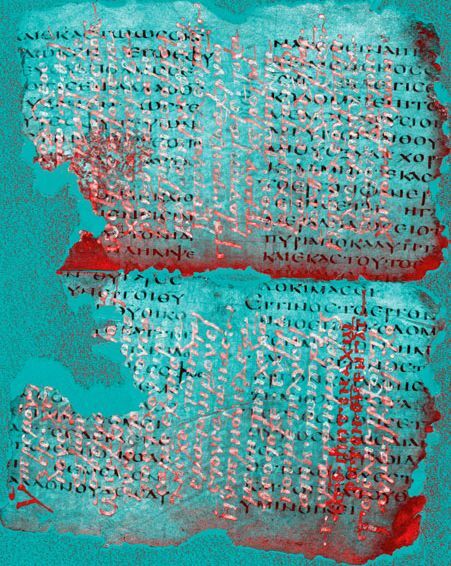 Keith Elliott has reviewed a collection of essays edited by Daniel Wallace entitled Revisiting the Corruption of the New Testament: Manuscript, Patristic, and Apocryphal Evidence here. To give you a flavour of the review and of Elliott's tone (behind the American copy-editing), I paste below the beginning and end. For some years many of those who present themselves as “evangelicals” have felt obliged to tackle several of Bart Ehrman’s publications, notably his The Orthodox Corruption of Scripture (now about to reappear in an expanded form) and Misquoting Jesus: The Story behind Who Changed the Bible and Why (inexplicably published in England under the bland title Whose Word Is It? The Story behind Who Changed the New Testament and Why). Some of his pronouncements about the reasons why certain changes found in manuscripts of the New Testament were made, and the seeming impossibility to restore the supposed original text, have ruffled fundamentalists’ and evangelicals’ feathers. His are books and conclusions that such apologists cannot neglect or ignore. Ehrman’s wellknown opinions, especially in the United States, have resulted in many attempted counterarguments. We have one such book here that has succumbed to the pervasive Ehrman influence. Ph.D. theses and students’ first publications, especially those by recent graduates in the United States, typically carry in a foreword overblown thanks especially to long-suffering family members and a justification of their own impeccable religious convictions. Such self-publicizing sanctimoniousness is usually cringe-making and toe-curling in its indulgence. Aficionados will find some plum examples of this risible genre here; almost all of the current essays include fulsome acknowledgements, and one (220) is ungrammatical. Perhaps the time is ripe to suggest a moratorium on such publicly paraded private sentiments. Mature scholarship and academic publications (especially those originating in Europe) tend to avoid such trivia and the wearing of a heart on the sleeve. To set an example, this review carries no dedications. Only today I became aware of this article in the Financial Times Magazine on work being done at St Catherine's at Mt Sinai. Not only is it worth the read, but it has a beautifully worked photo of a leaf of a palimpsest of Paul (1 Corinthians, to be exact). 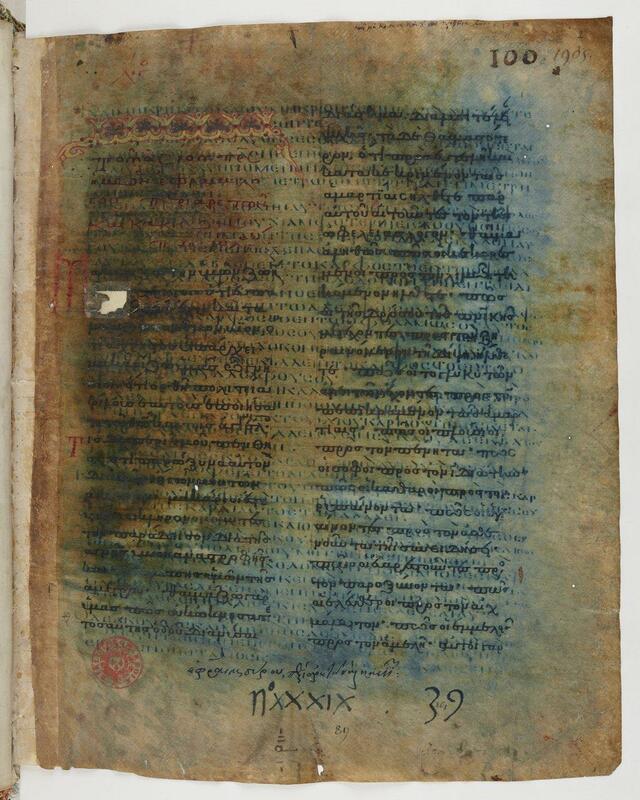 I had not seen this one before, and for the moment I assume it is 0289, which is listed as a palimpsest, is supposed to contain 1 Cor 3, and its overwriting agrees (I think) with the image of ΜΓ 99 I have in the New Findings catalogue. The date given in the Liste is VII/VIII and this is what made me doubt my identification. Given the closeness in lettering to say Codex Bezae or Alexandrinus, I would be comfortable with a fifth century date. OK, there is an enlarged initial, something (re)appearing in the fifth century, but the upsilon still looks earlier than some later versions of this Biblical Majuscule. The overall lettering is nice and square. People wiser than me are welcome to correct both my identification of the image with 0289 and/or my feeble attempt at redating. There are half-a-dozen ancient manuscripts which are the foundation of our understanding of the text of the New Testament writings. 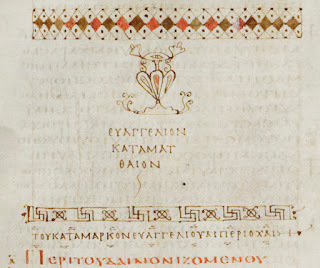 Among these stands the copy known since the sixteenth century as Codex Bezae Cantabrigiensis. 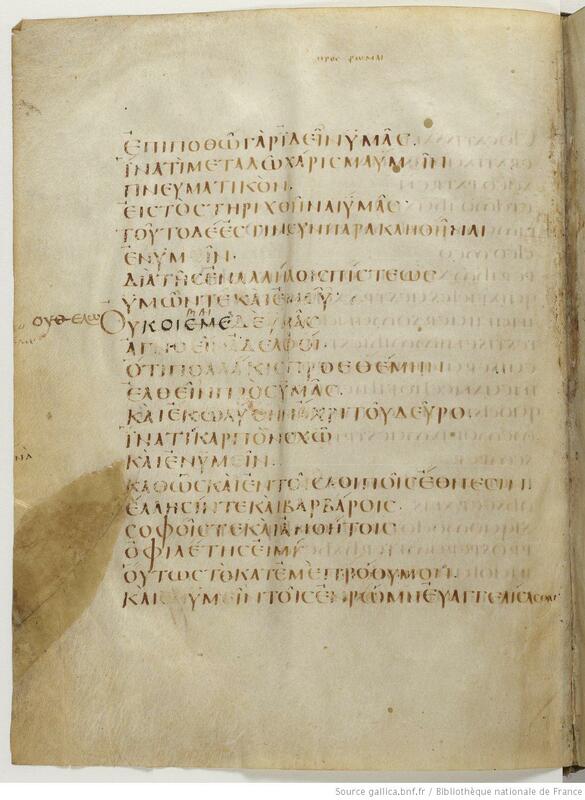 Any manuscript which has survived from antiquity is a marvel for this reason alone, and as we explore its pages, we have a rare opportunity to explore a little of the written culture of late antique Christianity. Although in the past century some remarkable papyrus manuscripts have been recovered from the sands of Egypt, their discovery has in general served more to highlight the significance of the parchment manuscripts than to diminish it. Click this link to access high-resolution images and transcriptions of the IGNTP.